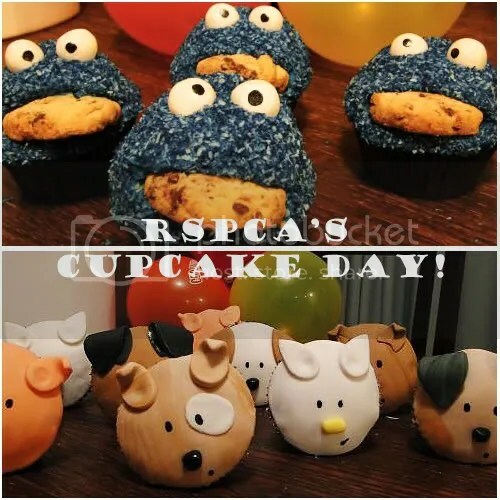 Those of you in the country may be familiar with RSPCA’s Cupcake Day. A friend alerted me to the event, and I couldn’t resist the idea of baking for a good cause. So I set up my donation page and started collecting donations. The response was phenomenal. Far more than I expected. When I started this cause, I thought if I raised $50 it would be worth it. When the online total reached $260 before the day itself, I was stunned. 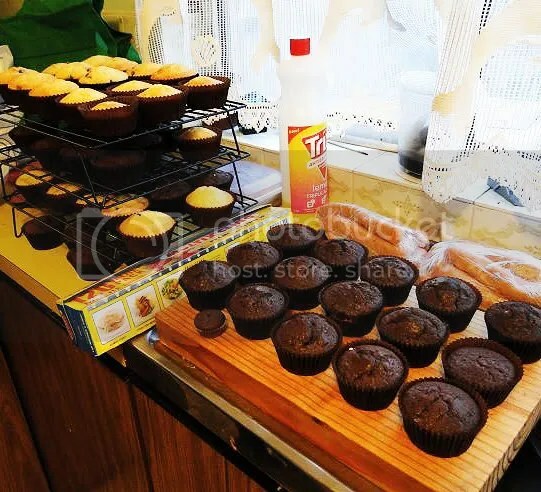 Here’s where you get to see how messy a baker I am, for my boyfriend was running around taking progress shots as I baked. I have a tiny kitchen that is ill equipped for most baking adventures. 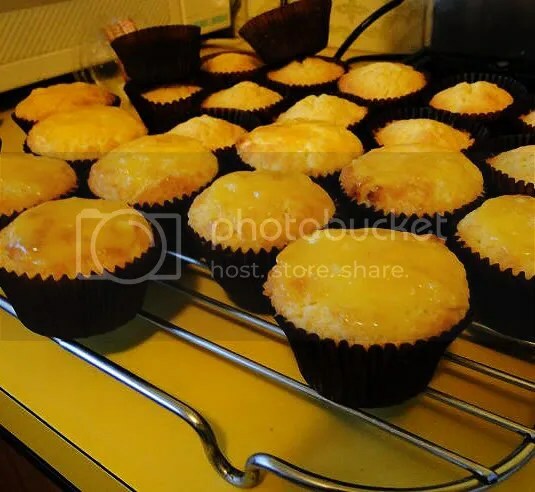 Those are lemon cupcakes with lemon curd and the almond cupcakes behind them. 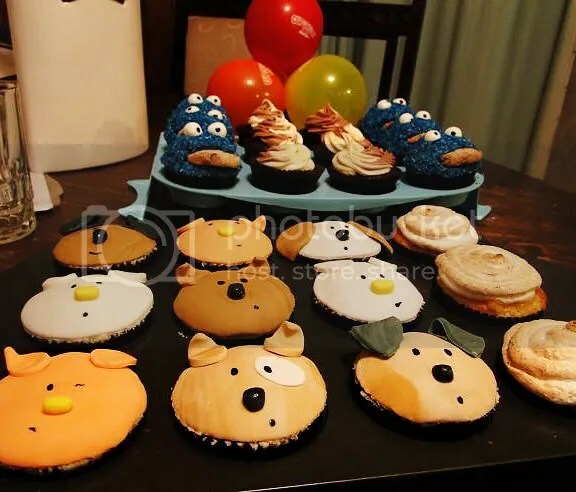 So the menu was: cookie monster, lemon meringue, nutella, cheesecake and almond cupcakes. Though nutella is misleading, because I used a generic brand of hazelnut spread. Those were topped with a duel choc/vanilla cream cheese icing. 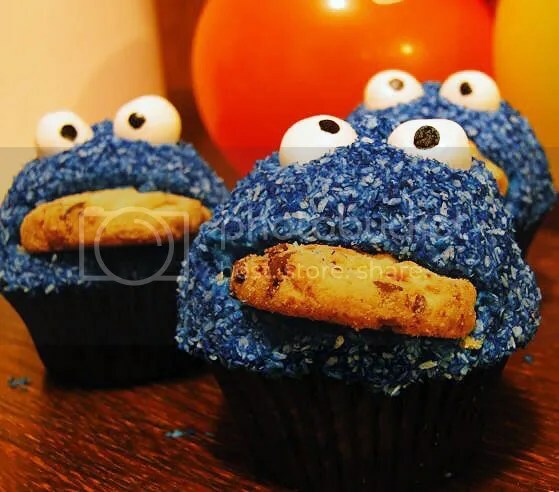 These cookie monster cupcakes were choc chip cupcakes that I topped with blue tinted icing, which was then dipped in blue tinted coconut. The eyes are kool mints and he cookies were store bought, because I figured I’d run outta time to bake the fresh. And then there were the puppies and kitties. 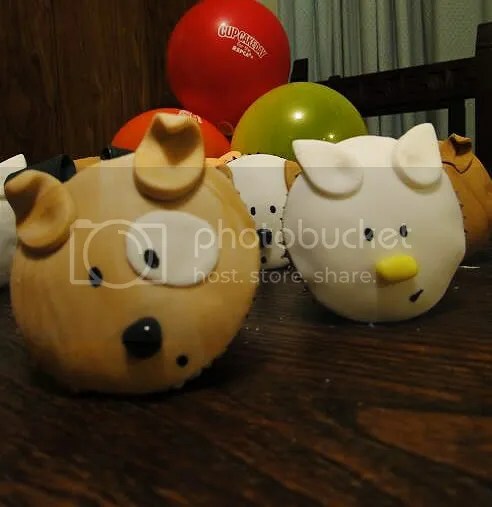 The original plan was to do 3D fondant figurines on these, but by the time I got to them I’d been baking 12 hours straight and just wanted to go to bed! So 2D it was. Underneath is an almond cupcake with an almond cream cheese icing. In hindsight, I should have given the kitties whiskers to make them more cat-like. The Uni batch all packaged up and ready to go. I gave another batch to my boyfriend to take to his work, my housemate to take to hers, and my sister to take to Uni. The response on the day was similarly astounding. 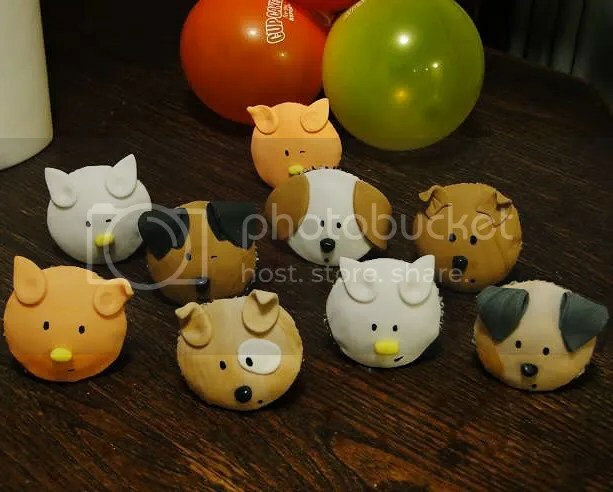 I got so many flattering compliments – people saying that they were amazing and the best cupcakes they’d ever tasted. I even got some people wanting to order some afterwards. 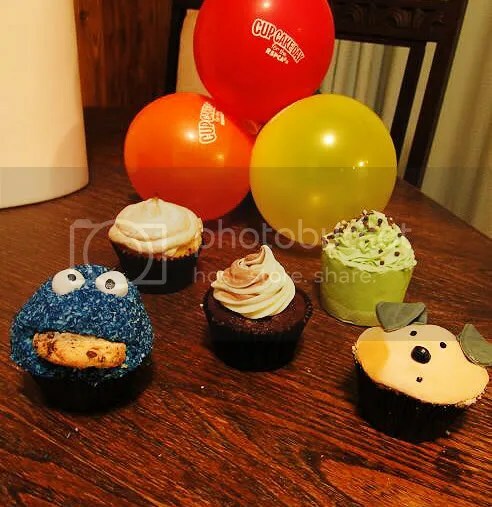 I hadn’t thought the cupcakes to be anything special, so it was so lovely to hear so. But most importantly, it raised a further $333.15 on the day. I added one more donation to bring the final total to $600. How exciting! 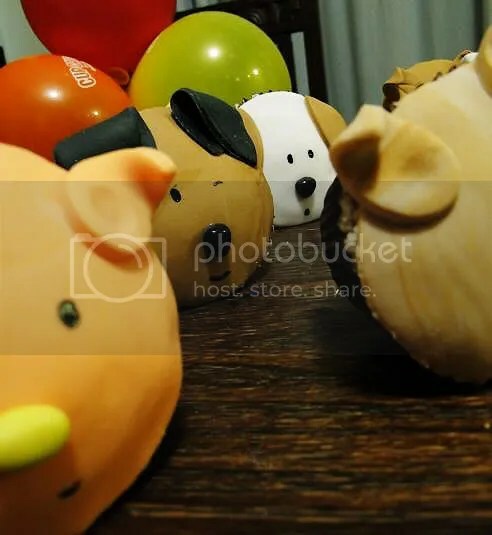 The finds raised will go towards the RSPCA’s costs incurred as a result of stopping animal cruelty: everything from the legal fees to those involved in seizing animals, which costs some $3million a year. 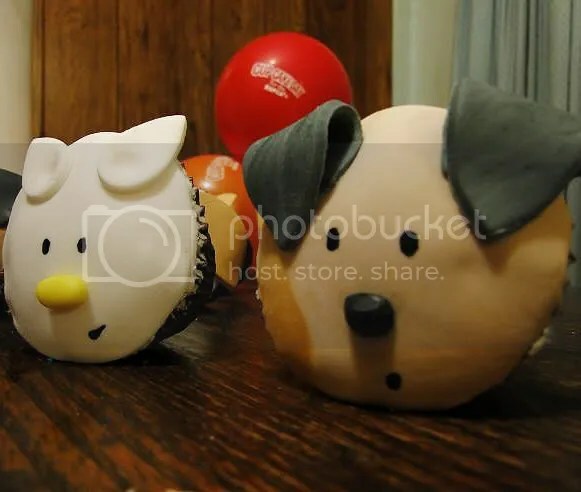 As an aside, they also have a Creative Cupcake competition for Cupcake Day. 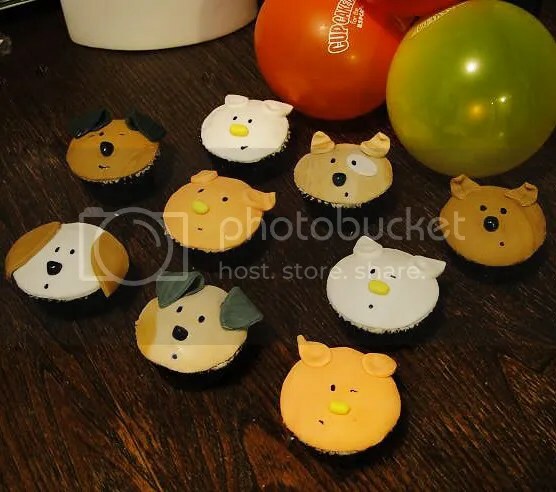 I have entered my puppy and kitty cupcakes, so it would be aweeesome if you guys could click the link and vote for them! Donated, eaten, loved and voted!